Producing Peadody Dance’s end-of-season student performances requires creative planning when it comes to filling boys’ roles, says Carol Bartlett, artistic director of Peabody Dance. In an effort to encourage boys to pursue dance and the arts, Peabody Dance approached the Estelle Dennis Trust Fund this past spring to support the launching of a scholarship program that allows boys ages 9 to 15 to study at the Preparatory one day a week. The Estelle Dennis Dance Scholarship Program for Boys, which debuted in September, is open to those who live in Baltimore City or County. In its efforts to reach out to the dance community, Peabody Dance offers master classes and teachers’ seminars on an annual basis. About a dozen of these boys will participate in Peabody’s ninth annual Day of Master Classes and Ballet Teachers’ Seminar from 9 a.m. to 5:30 p.m. on Sunday, Nov. 8, in the dance studios of the Peabody Preparatory’s Mount Vernon campus. This year’s seminar includes a new session called Training the Male Student. The new scholarship program draws inspiration from the 2000 movie Billy Elliot, which was later turned into a Tony Award–winning musical. Billy Elliot is the story of an 11-year-old boy from a working-class British family who discovers a passion for dance. On his way to boxing lessons, Billy stumbles upon a ballet class that he later secretly joins. Under the guidance of his teacher, Billy’s raw talent takes flight. Bartlett says that the program similarly wants to awaken talents in these Baltimore boys. Students selected to participate receive full tuition and free dancing shoes to attend Saturday classes during Peabody Dance’s 32-week fall/spring season. The program focuses on ballet, recognized as the building block for all theatrical dance forms. Participants are also introduced to other forms of dance, such as contemporary and hip-hop. In addition to classes, the boys attend dance performances and visit with professional dancers, both active and retired. The Peabody program builds upon the Estelle Dennis Dance Scholarship, established in 2005 with the intent of continuing the work and legacy of the local dance legend. The scholarship is awarded to an advanced male ballet student who resides in the mid-Atlantic region and is preparing for a career with a major ballet company. Peabody hosts the annual auditions. A leader in the contemporary American dance scene, Estelle Dennis dedicated her life and career to creating training and performance opportunities for young dancers in both the amateur and professional arenas. In 1934, the Roland Park native and former Denishawn dancer opened her Dance Theatre in a converted carriage house at 100 E. Monument St. in Baltimore. The Estelle Dennis Dance Group blended modern dance and ballet choreography with ethnic music and dance traditions, creating an entirely new American style. Dennis remained active at the Dance Theatre until 1986. She died in 1996 at the age of 87. 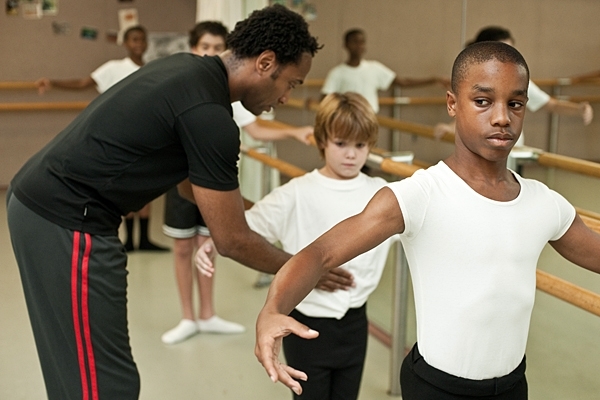 This past April, Bartlett, artistic adviser Barbara Weisberger and others at Peabody approached those overseeing the Estelle Dennis Trust Fund to support an effort to establish a dance program for boys at Peabody. The response was enthusiastic. Peabody hired former Pennsylvania Ballet dancer Meredith Rainey to teach the students, along with Peabody faculty member Tim Rinko-Gay. To help recruit the boys, Peabody reached out to leaders at Baltimore City and County public schools and at various cultural organizations, including the Heritage Theater Artists and the Arena Players Youth Theater. Peabody held a marathon set of auditions on May 18 at Roland Park Elementary and Middle School, Mount Royal School and Peabody. The sessions drew nearly 60 applicants. Twenty-four were selected. Bartlett and Weisberger are now in the process of writing a proposal seeking funding to extend the scholarship program. The plan is to add an intensive training program for the boys currently in the program, as well as to offer classes for new recruits and begin a class focused on boys ages 8 to 10. The next auditions will take place in late spring 2010.